Erin Martin tells how to give any style of kitchen a beautiful sense of balance. 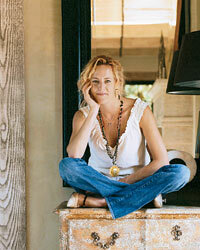 One reason why Erin Martin is Napa Valley's most sought-after interior designer: her genius with scale. In a small French-country kitchen, she installed hand-painted blue-and-white tiles and an elaborately painted ceiling mural that, together, make the room feel larger (left). To de-emphasize the bulk of a four-and-a-half-foot-wide marble hood, Martin designed a pattern of cutouts around the edge. In the Trinchero winery's new entertaining space, she designed oversize resin lights to give the massive kitchen a warm amber glow. Here, more of Martin's best kitchen ideas. "Different finishes add texture," says Martin, who used a cold-rolled steel border on the blue steel hood in Trinchero winery's new kitchen and entertaining space. What's the best temperature for storing wine? Martin installed wainscoting on the top half of a wall (instead of the usual bottom) for a fresh take on farmhouse style. The wainscoting under the statuary marble countertops, painted in Benjamin Moore's Copley Gray, protects against scuff marks. 888-236-6667 or benjaminmoore.com. Martin displays Cara Barer's graphic photographs of cookbook and dictionary pages above a 1920s work bench. She also cemented vintage silverware molds into the backsplash to break up the broad expanse of limestone. Photos from $1,100; 707-967-8787 or martinshowroom.com. The riveted leather and iron "Mantis" stools from Blackman Cruz have adjustable backs. $3,600 each; 323-466-8600 or blackmancruz.com.